How can I benefit from an intelligent usage concept ? After 36 months of use, you have paid 36 x CHF 2,385.00 = CHF 85,860.00 and have the JES Computers GmbH pick up the devices easily and at no additional cost. In this example, your savings compared to a classic purchase with upfront payment are CHF 4,140.00 (> 4.5%). 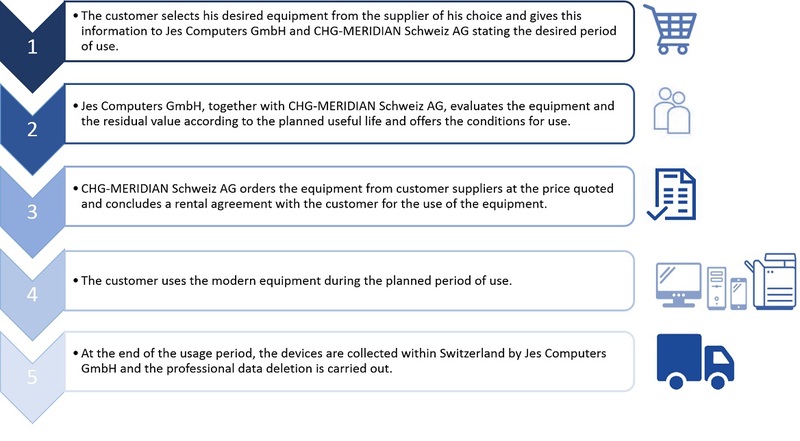 *The example is subject to change, subject to the refinancing of a customer and on the basis of the contract with CHG-MERIDIAN Schweiz AG. CHG-MERIDIAN is one of the world's leading manufacturer- and bank-independent providers of technology management services in the IT, industry and healthcare sectors. With around 1100 employees, CHG-MERIDIAN offers its customers integrated utilisation concepts for their technology infrastructure - from consulting, financial and operational services to remarketing services for the equipment used in two of its own technology and service centres in Germany and Norway and in cooperation with long-standing remarketing partners in Switzerland. CHG-MERIDIAN offers efficient technology management for large companies, SMEs and public institutions and serves over 11,000 customers worldwide with technology investments of more than CHF 5 billion. The company has a worldwide presence in 25 countries and 40 locations; its Swiss headquarters are in Baden, AG. 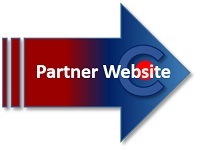 Would you like to learn more about our partner, visit CHG-Meridian here. Are you interested? Please contact our team of corporate customers without obligation !